Posted by Eddie & filed under Books, Mountains & hills, Travel, June 19 2007. 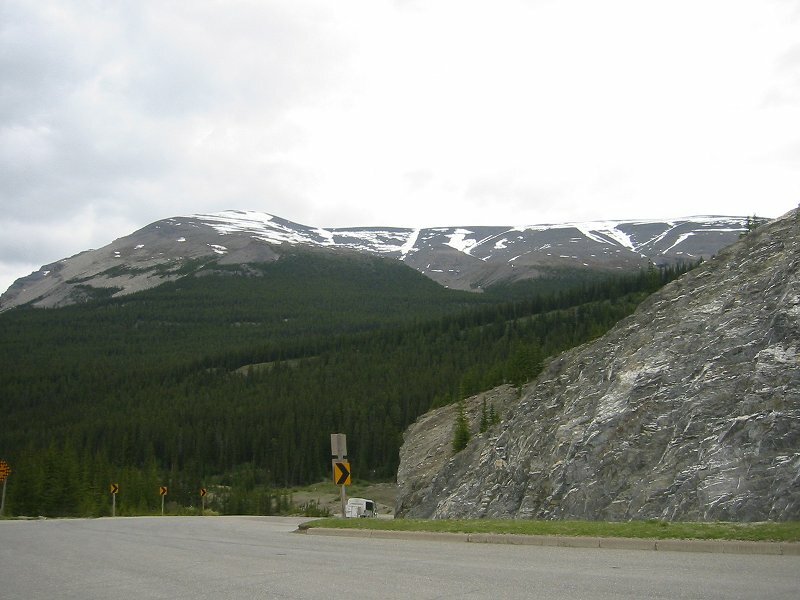 Although my recent trip to the Canadian Rockies wasn’t primarily a hiking trip, I still had plans to do some walking in Jasper National Park and possibly get up to some summits. 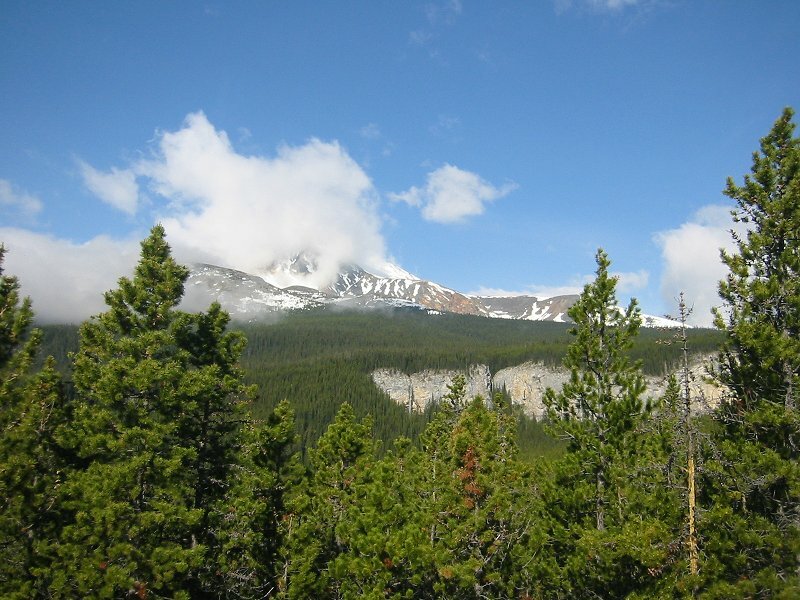 Here’s a list of the hikes I did on the trip whilst staying at Patricia Lake Bungalows near the town of Jasper. Pyramid Bench Lakes. Lesley and I took advantage of the network of hiking trails that work their way through the woods of the ‘Pyramid Bench’, an area of raised but relatively even (although not that even, according to Lesley!) land that Patricia Lake is on, directly above Jasper. It was great to set off from the front door of our lodge and just plunge straight into the woods. 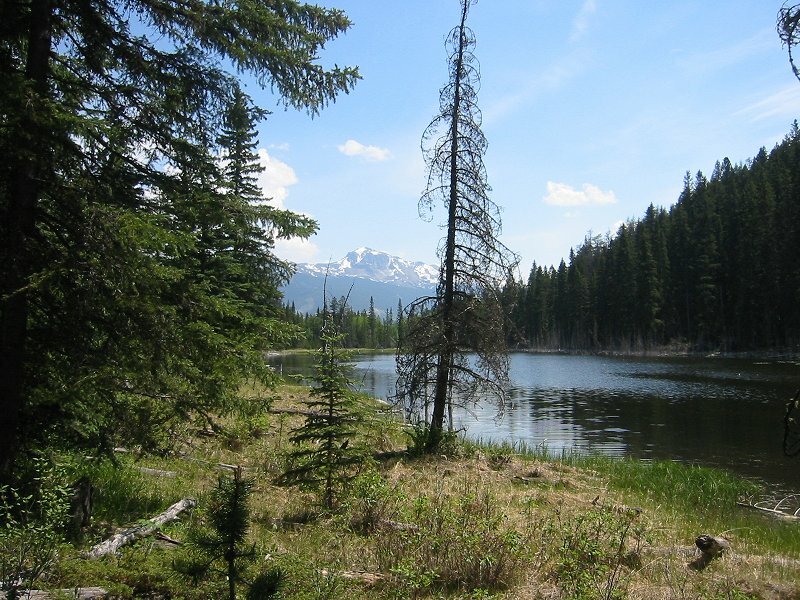 We walked in a large 10km loop that took about 3 hours and visited several of the lakes in the area, including the shore along Patricia Lake, Riley Lake and Upper & Lower Mina Lake. Lesley was a bit worried about meeting wildlife, but despite the area around the lodge being full of elk, we saw nothing much larger than a loon on Riley Lake. No bears in sight. We stopped for lunch at an idyllic spot between the two Mina lakes, with views to the snowcapped summits between the trees (photo here). These trails are quite popular, and we were passed by parties on mountain bikes and horses. The weather was very hot and sunny and by the end of the walk we were quite thirsty and tired but it was a good hike. The Whistlers. As mentioned in the previous blog posting ‘Canadian Rockies #1; Jasper National Park‘, Lesley and I also walked on The Whistlers (named after whistling marmots, but we didn’t see any), a ridge that curves up fairly steeply but easily to a minor summit at an altitude of 2466m, about 200m above the top station of the Jasper Tramway. It’s possible to walk all the way up here on a trail from the valley floor, an elevation gain of over 1200m, but why do that when there’s a handy cablecar? We climbed up to an altitude of about 2440m (I had my GPS receiver with me of course! 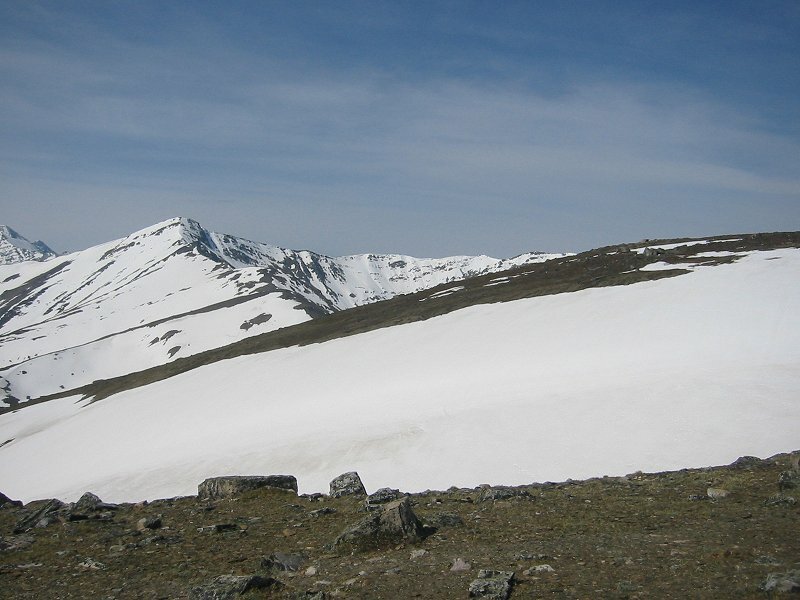 ), but there was a snowbank that barred progress to the actual summit (which we could have ploughed through safely, but would not have been any fun) so we were content to enjoy the view from a small plateau just short of the summit. We had excellent views under completely blue skies (photo here) to the Colin Range, Pyramid Mountain, Mount Edith Cavell, and in the hazy distance, the completely white hulk of Mount Robson towering over all the other peaks (Mount Robson is the highest mountain in the Canadian Rockies and is over 100km from The Whistlers). 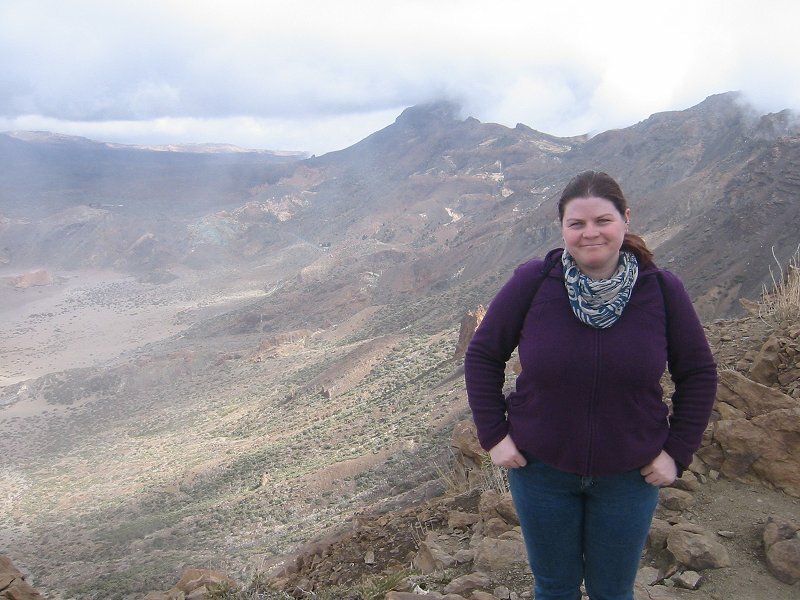 This hike was the highest altitude that Lesley had ever walked up to (just), her previous highest hike being to the rim of the Cañadas caldera at about 2400m on Tenerife (photo here). Beyond the summit of The Whistlers, the ridge continues to a higher summit at 2752m at the eastern end of Indian Ridge, and I had planned to potentially do this summit at some point during our stay in the Jasper area as it is relatively straightforward. 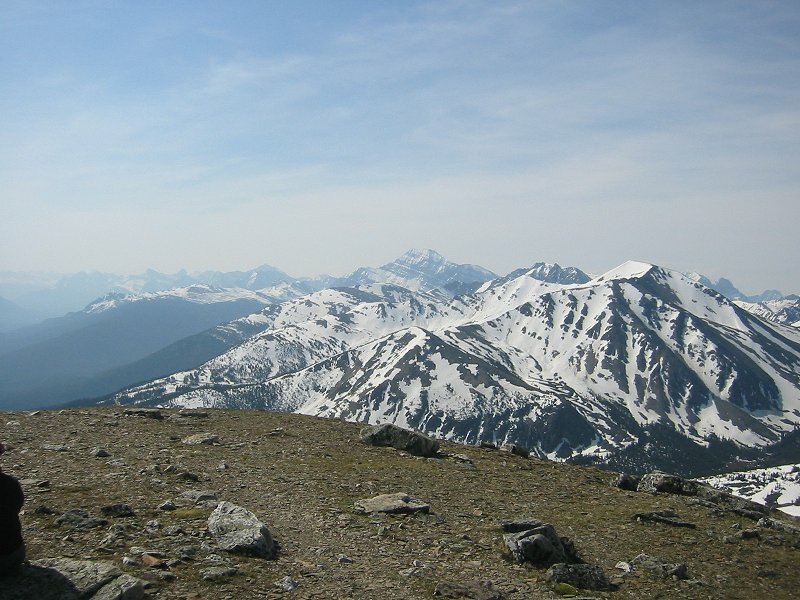 Unfortunately the snow conditions that I could see on the ridge beyond The Whistlers summit looked too dangerous – this was really my first indication that the large snowfalls of the previous winter were going to make hikes to any summits at all in the Rockies very difficult (photo here). Tangle Ridge. The day after our hike on The Whistlers, I planned to hike to the 3001m summit of Tangle Ridge (without Lesley who is not as obsessed by mountains as me) in the area of the Columbia Icefield. Tangle Ridge is one of the easier 3000m summits in the Canadian Rockies and I had seen the route through binoculars from Athabasca Glacier a few days previously, and it looked relatively free of snow (photo here). The elevation gain on the route to the summit is quite large, so I started out early, but the weather had turned since the previous day and there was a bit of rain. 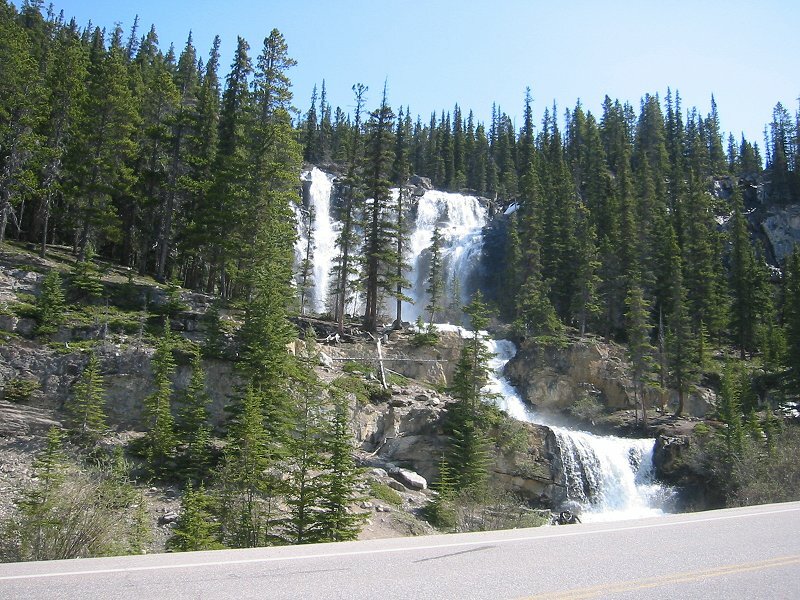 The book ‘Scrambles in the Canadian Rockies‘ by Alan Kane indicates that the route to Tangle Ridge from the trailhead at the Icefields Parkway follows the Wilcox Pass trail through thick woods for about a kilometre and then crosses Tangle Creek. However, the Tangle Creek Falls were a torrent when Lesley and I had passed this way a few days previously (photo here) and now when I approached the creek through the woods on the trail I could see that the river was an absolutely raging maelstrom – it would have been madness to attempt a crossing even with ropes or even a boat. This just indicates how hiking in the spring in the Rockies can be a totally different proposition to the summer or autumn – even though the route higher up was fairly snow-free, the recent snowmelt and rain had made a river that was usually easily fordable into an uncrossable barrier. So I had no choice but to give up on this hike. Pyramid Mountain(1). Upon returning to Jasper from Tangle Ridge I decided that as the rain had eased off a bit and it was still early enough in the day I would attempt Pyramid Mountain instead. Pyramid Mountain is a distinctive 2763m summit that is very prominent in the Jasper area and which I had tried to get to the top of on my previous visit to Jasper National Park in 1998 and had almost succeeded. I had lost confidence then on the steep scramble over the large boulders near the final summit ridge, giving up at about 2600m, but I felt that now (after 9 years of climbing mountains in Scotland, Norway, Spain and the US) I was better prepared. The initial hike to the mountain is on the ‘Fire Road’ trail, a gravel road that used to be maintained for access to a telecommunications tower that sits on the top of Pyramid Mountain, so the first 12km or so is an easy gradient, if a little monotonous. The total elevation gain of the hike is a considerable 1600m or so. On this second attempt as I was walking along the trail, the rain started up again, and the additional humidity and the mosquitoes made it very unpleasant. I finally gave up after 8km at the turnoff to the Palisades Lookout trail and called it a day. Moose Lake. After my unsuccessful day attempting Tangle Ridge and Pyramid Mountain, Lesley and I visited Maligne Lake and hiked the short 3km trail to nearby Moose Lake in the hope of seeing some moose (it was still raining). Lesley was more worried about the possibility of meeting a bear so we chatted loudly to each other to deter them but all we got was odd looks from other hikers, and no moose. Moose Lake feels surprisingly remote even though the crowds of tourists at Maligne Lake were not far away, and the gloomy overcast sky made it quite an eerie spot. Pyramid Mountain(2). Two days after my Tangle Ridge and Pyramid Mountain attempts, the weather was a bit better so I attempted Pyramid Mountain again, although the summit was shrouded in clouds (photo here). 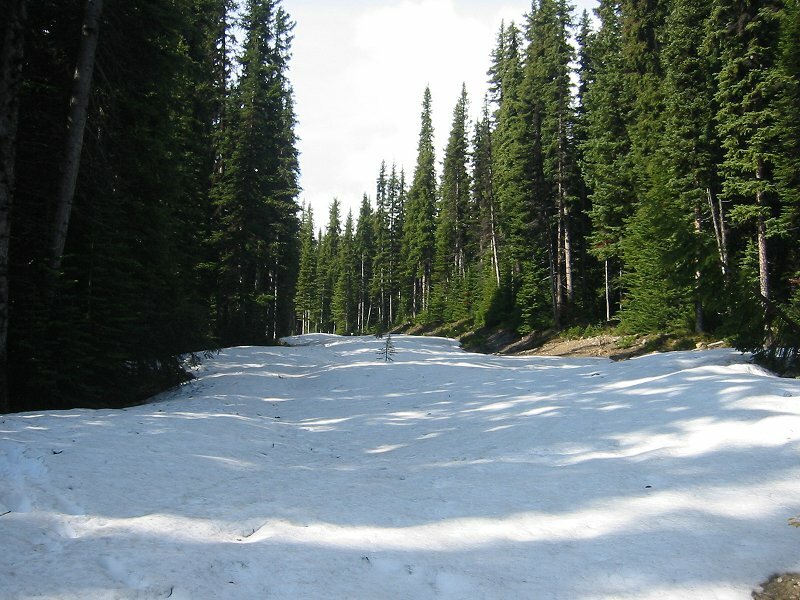 The gravel road approach was the same, but after the Palisades Lookout trail turnoff I was in for a surprise – snow patches appeared, and soon the road was covered in a thick layer of old snow that made the walking a real chore and slowed me down considerably (photo here). This continued until the end of the gravel road and as the clouds parted I was quite shocked at the amount of snow on the upper reaches of the mountain (photo here). 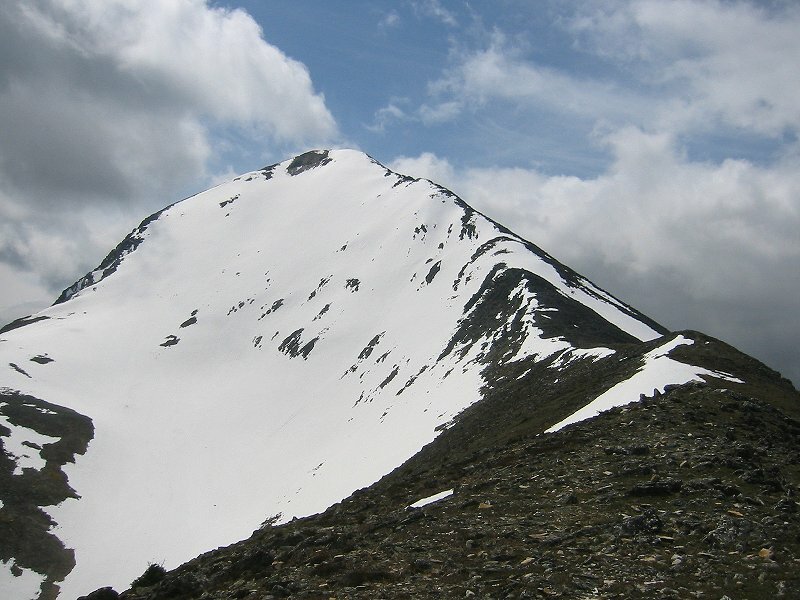 When I had climbed Pyramid Mountain previously it had been on almost exactly the same day in June, but then the route to the summit had been completely clear of snow. Now it looked all but impossible. I had my ice-axe with me though, and I resolved to see how far I could get. I noticed also that the telecommunications tower and the cablecar that was used to service it had vanished from the summit since my last visit – this must have been an example of the park authorities getting their way and restoring some wilderness to this bit of the Rockies. I managed to gain the north ridge of Pyramid Mountain at an elevation of about 2360m through relatively easy slopes of snow amongst small trees, and once I was on this level ridge the views opened up to reveal the fearsomely steep faces of the Victoria Cross Ranges to the west (the Victoria Cross Ranges summits have evocative but slightly incongruous Scottish names – Mount Kinross and Cairngorm) and the further summits of the Colin Range to the east (photo here). 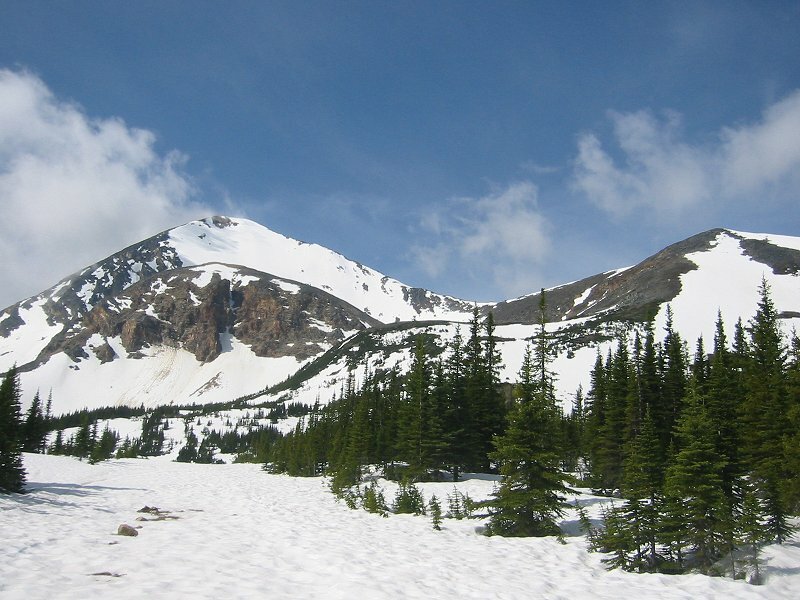 Beyond this ridge, the gradient to the summit of Pyramid Mountain increased sharply (photo here), and the snow became treacherous, alternating between boulder fields and loose but deep crumbly snowbanks (photo here). Eventually I decided that with some dark clouds to the west looking ominous, it was just not safe to continue. I had attained an altitude of 2530m (GPS receiver again! ), less than on my first attempt, but in much trickier conditions. So my third attempt on Pyramid Mountain ended there, but it was still a fantastic hike and I really felt that I had experienced some true Canadian Rockies mountain terrain. You can see a Google Maps display of the hiking trail and the photo locations (from GPS data) here. 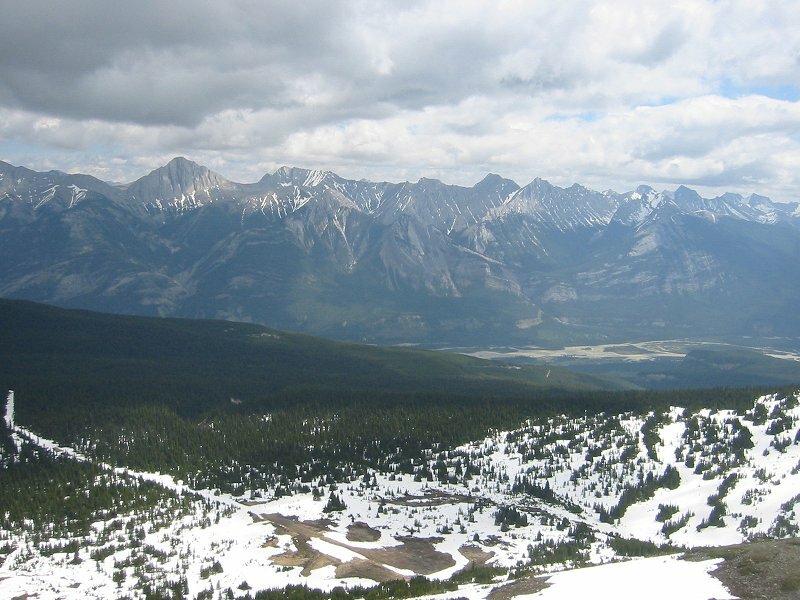 This experience just reinforced for me that attempting high summits in the Canadian Rockies in June (which is definitely still spring there, and maybe even winter at high elevations) is a very difficult thing to do, and that when I was on Pyramid Mountain previously in 1998 I was lucky with the conditions. 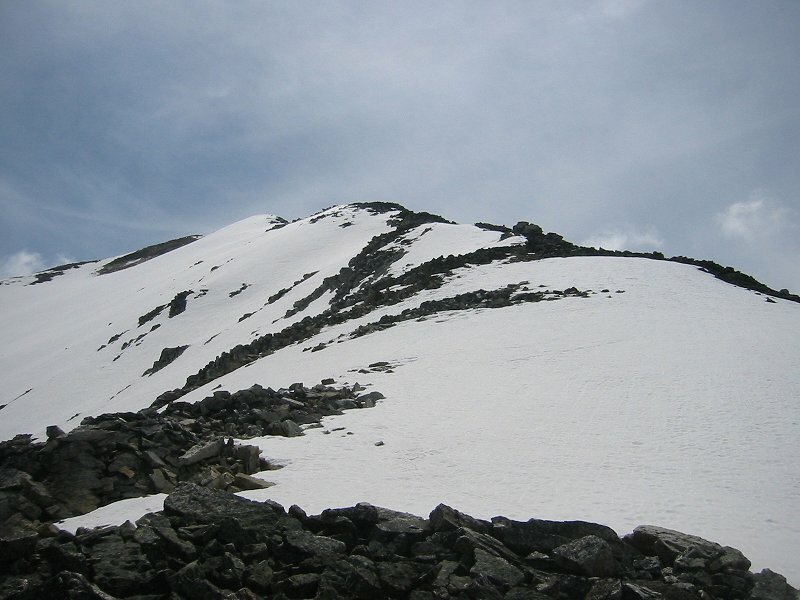 Even ropes, crampons or snowshoes would be useless on this type of steep terrain that alternates between bare boulder fields and deep spring snow. Add in the swollen rivers and it’s probably best to confine yourself to taking photographs of the wonderful snow-capped peaks at this time of year. This exhausting 11-hour 27km hike had one last sting in the tail – near the end of the day, about 20 minutes from the trailhead and my car, I saw a large orange bulk moving about in the small bushes by the side of the gravel road about 70m ahead of me. The colour of it confused me for a second until I realised it was a bear. Afterwards I identified it as a fairly rare cinnamon-coloured black bear, but at the time I just knew it was something I had to be very careful of. I stopped dead in my tracks and I retreated slowly, pulling my cannister of bear spray from its holster and making sure it was ready to use, fully aware that I was on my own. Despite me making some noises by clapping my hands, the bear was not aware of me and I realised that this was probably because I was downwind of it. I then started shouting, and at this the bear looked up and saw me and promptly ran off into the woods. The whole experience left me more surprised than anything and I was glad that I had had the encounter – what all the guidebooks say about black bears being quite shy animals and preferring to stay away from humans rather than attack them seemed to be borne out by what had happened. If it had been a grizzly of course, then things might have been different. It also seems to be the case that the techniques to deter bears that some books advise when you go hiking in the Rockies, like wearing a bell or clapping, are pretty useless – you really have to make quite a loud noise for them to hear you at any sort of distance. Of course, doing this constantly, even in a group of hikers, would make for a pretty odd and miserable sort of day. Really, the only approach that I believe one can take to this is to realise that hiking in the Rockies carries an inherent but small risk of potentially dangerous animal encounters (whether that is with a bear, cougar, wolf, elk or moose) but that this risk is probably less than having an accident whilst driving. Also, animals like this are part of the attraction of the Rockies and what makes it an exciting place to hike in – there are plenty of places to go with no dangerous animals at all (like Scotland) if one so wishes, but then if one wanted a life with no excitement, one could stay at home and watch TV all the time (but even then there is the risk of watching Big Brother and dying of boredom). mmmmmm……. doubt if I’d have tried to attract the bear’s attention. Or you could have sneaked up on it and given it a really big fright.